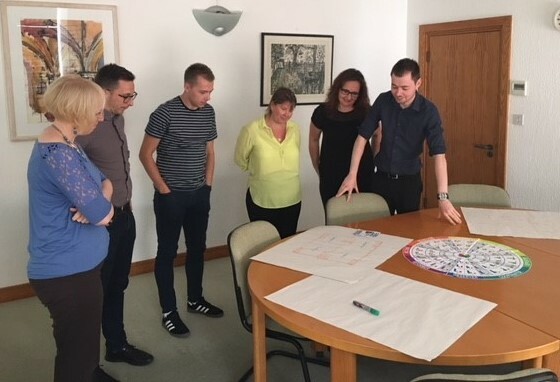 Dedication to training and development is the value at the heart of Jarrold, and now an elite cohort of Jarrold Retail managers have started the Team Leader/Supervisor Apprenticeship, with our year-long ILM level 3 Diploma. While the programme initially seemed daunting and a big commitment, the group have dived in headfirst and have found the learning experience truly engaging and rewarding. With a modern Apprenticeship we have the time to focus on learning, and to shape the training to students’ own personal styles. This time and aligning of learning style to teaching method is already generating tangible results in the work place. The classroom sessions are more engaging than some of the learners may have anticipated, as they are a mix between lectures, activities, games and projects, and everyone gets involved to learn together. So, when the group were challenged to design a game in order to teach others about Situational Leadership, as defined by Hersey and Blanchard, the result was happy learners, operating at a higher level of cognitive thought process, teaching each other through design, play and discussion. Gamification is a brilliant formative assessment technique but it also promotes motivation and develops the functional and soft skills of the delegates. In the session from which the photos are taken, we see some peer group working, presentation skills and pride at the resources they created for training another team. The session was unit 8410-300, Leadership Styles and Coaching, and focused on how to practically apply those skills, before heading back to the workplace. With a deeper understanding of Leadership styles, and the difference between Coaching, Mentoring and Training, the skills learnt will be consolidated when put to practice in the busy retail environment. We are really proud of our learners, who have took on the innovative approach, and are becoming more aware of their team’s behaviors and motivational needs. They embarked on the journey with some trepidation but have grown and are proving themselves to be brilliant students and leaders back in the workplace. ‘Learn. Develop. Be Brilliant,’ really is what it’s all about.